Assembly Required: Item delivered flat packed however easy assembly with comprehensive instructions included. This Bentley Wellington Boot Rack is a way to keep boots and other items appropriately stored away. The rack features a medium sized area to hold boots or other footwear, a slanted roof protects against the elements and a slatted design which allows for better air circulation and prevention of fungi. 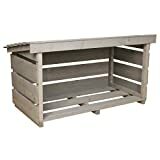 This item has a grey washed finish and is made from Nordic spruce wood which has been pressure treated to ensure it remains rot free. Please note: Item will be able to store 5 pairs of boots depending on their size.